In Florida, America’s most notorious swing state, a recount for the governor’s race hasn’t changed the final results — Republican Ron DeSantis is still edging out Democrat Andrew Gillum by less than half a percentage point. But the recount in the Senate race rages on, as the state begins a mad dash to hand count the ballots by the state’s Sunday deadline. Gillum only picked up one additional vote in the machine recount that ended Thursday, leaving him less than 34,000 votes behind DeSantis. But Gillum has refused to concede, leaving the future of election up to the courts, where the fate of tens of thousands of ballots lay in the balance. Meanwhile, in the Senate race, Republican Gov. Rick Scott’s margin of victory grew slightly, but still rests only .15 percent over incumbent Democrat Bill Nelson. Under Florida state law, a manual recount is triggered if it’s less than 0.25 percent. The machine recount was due at 3 pm on Thursday, but since the margin in the Senate race was less than 0.25 percent, a manual recount will now begin. Manual recounts are due at noon on Sunday, November 18. If counties cannot meet that deadline, the state will adopt the first round of tallies, which was submitted last Saturday. 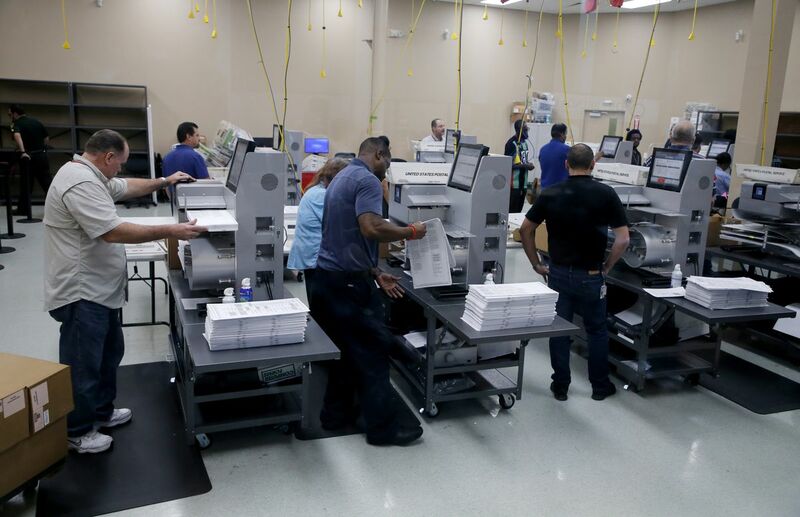 On Thursday, Palm Beach County, the state’s third largest, which faced trouble this week when some of its decades-old machines overheated and miscounted more than 170,000 ballots, couldn’t complete the recount by Thursday. And Broward County, another Democratic stronghold, completed the recount, but missed the deadline by two minutes — and the state rejected the results. Nelson’s campaign has expressed confidence that the hand recounts will change the final results. Gillum had already conceded to DeSantis last week, but withdrew his concession Saturday, hours after Florida’s secretary of state announced that the gubernatorial election would go to a recount as well. The stakes are high, given strikingly contrasting visions for the state and the country — and given that Republicans have a bare 51-majority in the Senate (one they would expand if Scott wins). Whatever happens in Florida could have huge national consequences. Elections staff load ballots into machines as recounting begins at the Broward County. Elections in Florida are almost always very close. And this year, even in a midterm cycle, was no different. While the early results seemed to favor Democrats, Republicans, like in 2016, showed their might by the end of election night and gained a very narrow lead. But not all the votes had been counted, and as the end of the week drew near, Nelson and Gillum saw their vote totals grow as more votes came in from the populous southeastern parts of the state. In Broward County, the second-most-populous county in southeastern Florida that covers part of the Miami metropolitan area, Nelson won 69 percent of the votes and Gillum won 68 percent, each contributing more than 400,000 votes to their total tallies. Those statewide totals have only grown as more absentee, early, and Election Day provisional votes were counted. Ultimately, the first recount didn’t prove too fruitful for either Democrat — Gillum only picked up one vote, and Scott picked up 865 votes in the recount. But the Senate race isn’t over. In Florida, if the margin of victory is 0.5 percent or less, a machine recount is ordered. If that margin is 0.25 percent or less, the state will trigger a manual recount, where the “overvotes” and “undervotes” are counted by hand. This matters, particularly in the Senate race. For example, in Broward County, of the 714,859 people who turned in ballots, only 682,453 voted in the Senate race, according to the current count — less than almost every other statewide race on the ballot. Broward County is a Democratic stronghold in Florida. Why there have been so many undervotes in Broward County remains a mystery. Some have said it’s because of how the ballot is formatted, putting the Senate race on the bottom of the page under a long block of voting instructions. But Nelson’s lawyer thinks it’s a machine error that would be rectified with a hand recount. A recount also means that provisional and overseas absentee ballots — all of which are typically counted after Election Day — are counted, a process that can at times take more than a week. This is where the process gets tricky. There are always mail-in ballots and provisional ballots that aren’t counted — due to a lack of ID or matching address — that can be counted if they are rechecked. Typically, voters are notified of errors and have to sign an affidavit “curing” the mistakes before Election Day. But there are always ballots turned in on Election Day, as well as provisional ballots, that can’t be re-checked. According to Daniel Smith, a political scientist with the University of Florida and an election watcher, of the mail ballots returned on Election Day, more than 13,000 had issues. My database yesterday revealed that of the 126k VBMs ‘returned’ on Election Day (in FL, VBMs (except overseas) must be received by SOEs by 7pm on Election Day), over 13.4k had problems. Originally, voters had until last Thursday to make sure their vote counted, or “cure” their votes of any errors, before county supervisors had to submit their first tallies on November 10. But on Thursday, a Florida judge sided with Democrats, ruling that voters have until 5 pm on Saturday, November 17, to address problems with their ballots — which could affect thousands of votes. On Monday, Trump argued that the state should restrict the number of ballots counted to just those from Election Day, which would discount the votes of thousands of Floridians, including overseas military voters. Democrats are prepared for the long haul — even Gillum, who gave a teary concession speech on election night. “We are committed to ensuring every single vote in Florida is counted,” his campaign has since said — a sentiment they continued even after losing the recount. And Nelson has taken the fight to the courts, suing to make sure that counties have enough time to count the ballots, and are counting as many ballots as possible. Because provisional ballots overwhelmingly favor Democrats, it’s in Nelson’s interest to make sure as many ballots are counted as possible. In response, Scott, the current governor, has argued that fewer ballots should be counted. His campaign responded to the judge’s ruling saying they would appeal the decision. Meanwhile, DeSantis, who claimed victory in the governor’s race, has been acting like the presumptive nominee for some time, appointing a transition team. Recounts rarely change election results. Then again, sometimes they do. For most election watchers, the idea of a Florida recount gives Democrats flashbacks to the 2000 presidential election, when George W. Bush beat Democrat Al Gore by 537 votes in Florida after a partial recount that was ultimately halted by the Supreme Court. One report after the race found that if the entire state had had a thorough recount under certain rules, Gore likely would have won. That was a highly unique case. That said, it’s also unusual for a recount to change the final results of an election. Al Franken’s win in Minnesota’s 2008 U.S. Senate race, Thomas M. Salmon’s win in Vermont’s 2006 auditor election and Christine Gregoire’s win in Washington’s 2004 gubernatorial race. But that doesn’t mean the senate race in Florida isn’t close enough to become part of that statistic. It’s worth noting that in 2016, Elias, currently Nelson’s elections lawyer, was general counsel on Hillary Clinton’s campaign, when he said that Clinton’s chance of winning through recounts was next to none. “The number of votes separating Donald Trump and Hillary Clinton in the closest of these states — Michigan — well exceeds the largest margin ever overcome in a recount,” he said then. Last week, Elias had a very different tone; he told reporters he was “confident” Nelson would win.